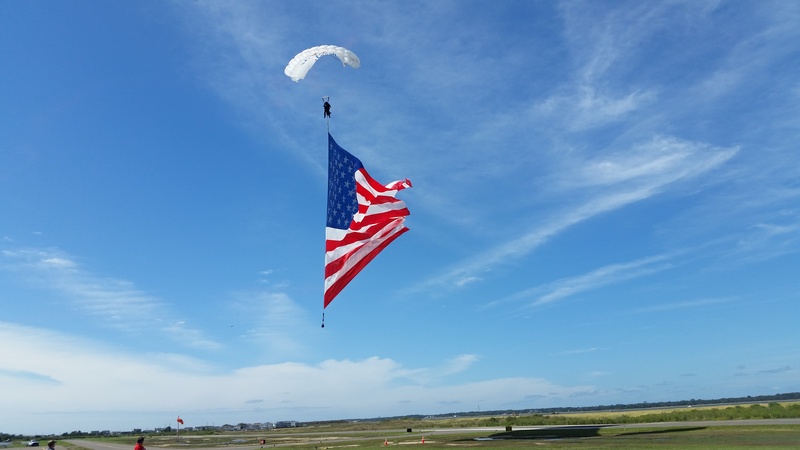 Skydiver Larry Compton prepares to touch down at Ocean City Municipal Airport while tethered to a gigantic American flag. 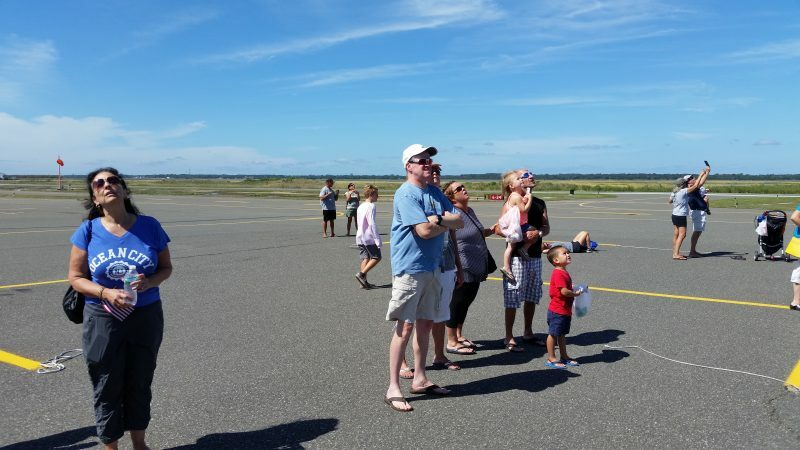 At exactly 12 noon Saturday, the spectators peered overhead and began pointing to what appeared to be three tiny white clouds that looked like fluffy cotton balls. As the seconds ticked away and the white objects moved closer to earth, it became clear that they were actually the billowing parachute canopies of three skydivers descending on the Ocean City Municipal Airport for its annual air festival. “That guy has a double one. Do you see it?” one woman excitedly asked her companion, referring to a skydiver who had two parachutes. Then two more skydivers were spotted, both whirling around in circles while releasing a patriotic-themed red, white and blue trail of smoke to entertain the crowds below. Spectators look overhead to watch the Team Fastrax skydivers perform their aerial stunts. After the first five parachutists had landed amid cheers and applause from the spectators, one more skydiver, Larry Compton, floated overhead, tethered to a gigantic American flag fluttering majestically in the wind. As he prepared to touch down, Compton fought some wind gusts while picking out his landing spot. The flag, 125 feet long and 63 feet high and weighing a whopping 200 pounds, dangled just below his feet. “It’s beautiful. I got to see the entire coast, all the way to Atlantic City,” Compton, 52, of Bowling Green Ky., said moments after he was welcomed on the ground by the cheering airport crowd. Compton and the other parachutists are part of the Fastrax professional skydiving team based in Middletown, Ohio. They were the highlight of the airport festival on Saturday, the first day of Ocean City’s Air Show Weekend. Team Fastrax is also one of the scheduled performers for Sunday’s air show. The Boardwalk Aerobatic Air Show will bring some of the best stunt pilots and aerobatic champions in the world for a spectacle over the beach and Boardwalk between Sixth Street and 14th Street beginning 1 p.m. 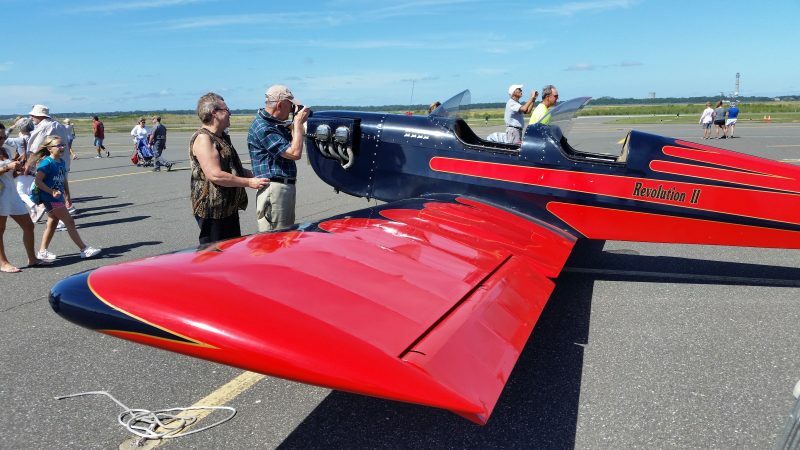 Airplane buffs Bill and Linda Parker, of Galloway Township, take photos of a plane on the airport tarmac. Some of the spectators at Saturday’s airport festival said they planned to attend the air show on Sunday to make it a full weekend of aerobatic and skydiving thrills. “I like airplanes. Any airplanes,” Bill Parker, 85, a resident of Galloway Township, said while he was snapping photos of the planes lining the airport tarmac. “I just love it,” Parker’s 76-year-old wife, Linda, said of the air festival. An airplane buff from another generation, 10-year-old Sawyer Booth, marveled over an old Piper Cub. His father, Warren Booth, of Doylestown, Pa., said his son has developed a keen interest in aviation at such a young age. “Do you want to become a fighter pilot?” Booth asked his son. “Yeah, that or become an airline pilot,” Sawyer replied. Warren Booth, of Doylestown, Pa., and his 10-year-old son, Sawyer, stop to admire an old plane. A love of planes, it seems, runs in the blood in the Booth family. Warren Booth, 44, who has a summer home in Ocean City, is a pilot for JetBlue Airways. 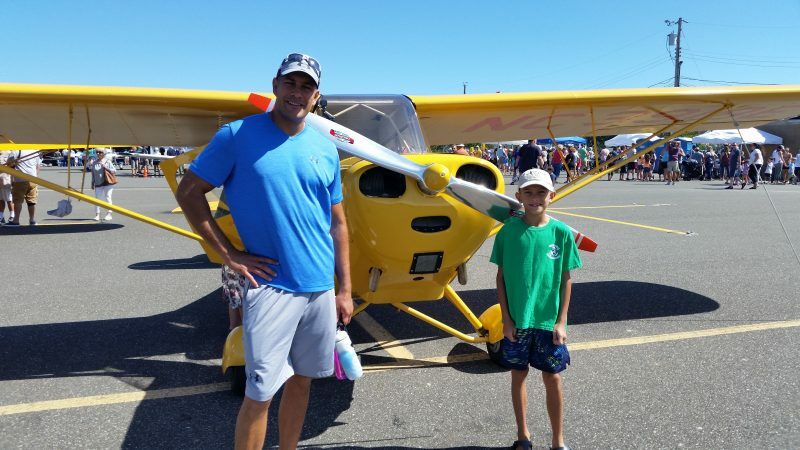 He learned to fly in 1996 by mastering the types of small planes now admired by his son. “I want to fly the sleeker, more maneuverable planes,” Sawyer said. “Yes, we’re a couple of airplane geeks,” Warren Booth said, smiling. 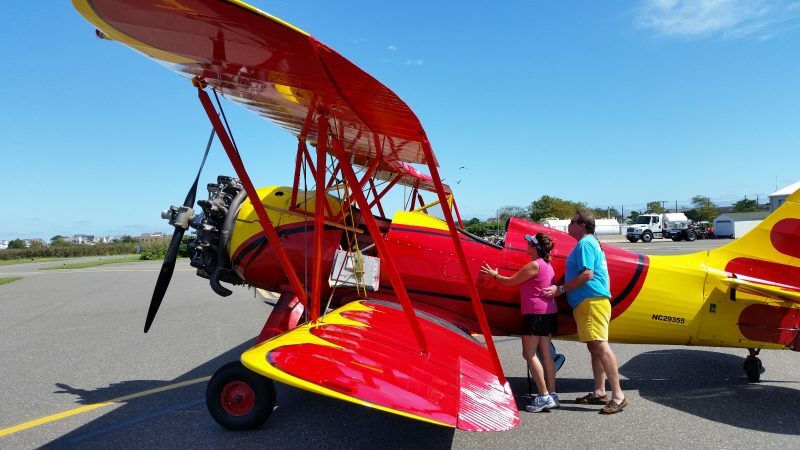 Glen Mills, Pa., residents Susan and Roger Church, who were celebrating their 28th wedding anniversary Saturday, stopped on the airport tarmac to check out a 1941 Waco biplane operated by Red Baron Air Tours. The Churches, who have a summer home in Ocean City, peeked inside the open cockpit of the historic red plane and thought about taking a ride with the Red Baron pilot. “We love the Red Baron. We see this plane flying over our house all the time,” Roger Church said. The Churches decided not to take one of the quick excursion flights that Red Baron was offering on Saturday during the festival, but promised to be back in a few weeks for a longer trip in the biplane. “See you in October,” Roger Church called out to the Red Baron pilot. Susan and Roger Church, of Glen Mills, Pa., peer inside the cockpit of a 1941 Waco biplane operated by Red Baron Air Tours. 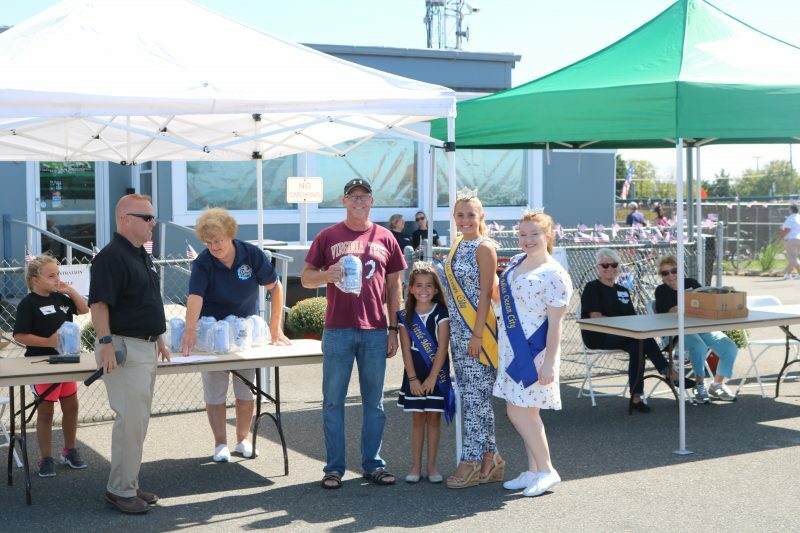 Best of Show aircraft winner Dave Shuster, center, is joined by Ocean City Municipal Airport manager Todd Dwyer, Little Miss Ocean City Stevie Wright, Miss Ocean City Megan Keenan and Junior Miss Ocean City Julia Wilson. Pre-War: 1929 Stutz, Robert Praetoris of Petersburg, N.J.
Post-War: 1957 Ford Thunderbird, Nick Careyote, of Columbus, N.J. Drivers Choice: 1935 Chevy Hot Rod, Ted Gooding, Galloway Township, N.J.
* Additional highlight photos can be seen on our Facebook page.